Alfred Herbert Ltd of Coventry, Warwickshire. 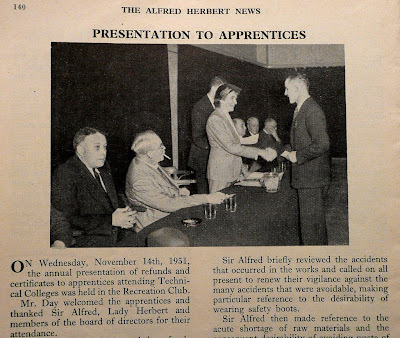 Alfred Herbert Limited were machine tool makers in Coventry. 1866 Alfred Herbert was born, the son of a wealthy landowner. The extent of the Herbert family fortune was considerable. His father, in addition to owning a town house in a salubrious area of Leicester, was the largest landowner in the parish of Whetstone, south of Leicester. Alfred Herbert was educated at Stoneygate Private School, and was destined for University and/or parsonage, until he met up with an old school friend William Hubbard, who worked on a lathe at Joseph Jessop's Engineering Co in Leicester. Herbert was fascinated by what the small lathe produced, so he persuaded his father to let him follow his friend's example. Subsequently he became an apprentice at Jessops. Later he became the manager of Coles and Mathews of The Butts, Coventry, and began producing machinery for the cycle trade, with guaranteed orders from the Premier Cycle Co (owned by his brother William). 1888 On Mathews' departure, Herbert bought the business for £4000 in partnership with William Hubbard. With the help of Hubbard's considerable inventive capacity, they began making drilling machines and hand lathes, which sold very quickly at about £28 each. The letterhead of Herbert & Hubbard's firm. Note the logo - the 'Great Paul' - the bell which Alfred had seen being transported to London when he was at school at Stoneygate. 1889 Alfred Herbert and William Hubbard's business was in Upper York Street, Coventry, under the name of Herbert and Hubbard. After a time the partnership foundered and Hubbard was bought out. Later the firm became known as Herbert Machine Tools and eventually grew into the world's largest machine toolmaking company. 1889 Pill picking and sorting machine. 1912 Directory. As machine tool makers of Butts and Ironfounders of Canal Road, Edgewick. 1914 Listed as machine tool makers. Specialities: hexagon turret lathes, capstan lathes, automatic turning machines, automatic screw machines, milling machines, ball bearing drilling machines etc. Employees 2,000. 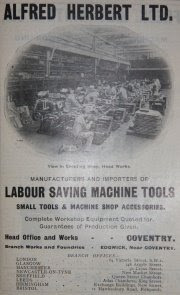 1919 Labour saving machine tools. 1920 February. Issued catalogue entitled 'The Turret Lathe and its Work'. 1920 June. Capstan Lathe with Rotating Multiple Stops. Photo and article. 1920 June. Small surface grinding machine. 1920 September. Exhibited at the Machine Tool and Engineering Exhibition at Olympia with ten stands of machinery, tools and other equipment. 1957 Alfred Herbert died on 5th June 1957 and since the entrepreneur's death, the firm has been one of decline. 1961 Tool makers, mechanical engineers, importers and factors of machine tools, components and small tools. 4,700 employees. 1968 By this date they also owned Holbrook and Sons and Churchill Machine Tool Co. In 1980 Tooling Investments took over the firm, but with debts three years later of some seventeen million pounds led to the firm's collapse.